After Applejack bequeaths unto them her old tree house to use as a new club HQ, the Cutie Mark Crusaders once again set about trying to uncover their special talents. After general shenanigans, they learn about an upcoming talent show at the school. That’s when things really get interesting. Last week, we explored a Cutie Mark Crusaders episode, and let’s just say it didn’t win me over. I didn’t dislike it, I just didn’t click with what it tried to do with the trio, and much discussion was had, along with a warning from Gerf that this week would also be all about the Crusaders. I didn’t cringe, but I wasn’t exactly enthusiastic, and even continue to wonder why the two were placed back-to-back instead of giving them a little breathing room apart. Could it be they themselves weren’t entirely satisfied with how the previous episode came off and felt this was a way to quickly win people back over? Who knows, though I will say they certainly won me over. I love this episode. The basic concept of the team and their dynamic is still very much the same, with them going all gung ho in search of their Marked purposes in life, and leaving a trail of failure and disappointment in their wake. In the last episode, this was treated as an annoyance as they made the grown ups’ lives miserable and messed everything up for everyone else. Here, things are a bit different. Right from the start, when Applejack bequeaths them her old tree house to use as a club HQ, and they set about making it over, we see that each of the Ponies does have genuine talent and ability. Applebloom is a handyman and decorator who sets about renovating the place. Scootaloo is a gifted map maker, as well as an athlete and dancer. Sweetie Bell not only has a marvelous singing voice, but is a lyricist. None of these three ponies lacks talent, they just lack self awareness. They’re so used to their strong suits that even when others point them out, they don’t think of it as anything special, just the way they are. Everything we got in the last episode was about what the CMCs weren’t good at, and by here revealing what they are good at, it deepens them as characters who are so caught up trying to be something cool or following in a hero’s footsteps that they overlook what makes they themselves special and fail to recognize talents for what they are. And to the credit of our adult characters, they recognize this in the children, and instead of trying to forcefully point out what the kids don’t understand, they’re gently trying to guide them in that direction, and patiently sigh as that doesn’t work, as they know the CMCs will figure it out some day. I love that final moment, of Twilight all set to fire off a lesson to Princess Celestia, only for the kids to continue not getting it. It makes their arc not about failure, but setup for a success we know they’ll one day achieve, and we’ll be there to cheer when they do. And with regards to the failure, I actually don’t think they’re as spectacular of flops this time around as they have been in the past. Yes, we get another montage of them trying out a new batch of Mark talents to see where they fit in the world, but aside from an unfortunate dye job, most of them just end with disappointment that this task isn’t for them instead of them actually doing a bad job at it. They bungle, yes, but not to catastrophic or embarrassing proportions, and I like that we see the sadness as they gaze at their still bare flanks, then light up with the “can do” of another attempt. It’s not only they who have endless potential, but the world of options they get to explore. Makes me actually think being a CMC may ultimately lead to a richer experience given all the time they spend seeing what life is like for others. 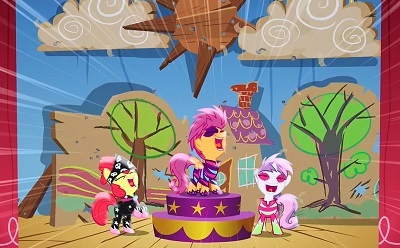 And at the talent show, while their number is spectacularly garish and gaudy, and not very good – Sweetie Belle made rickety sets and costumes, Scootaloo is belting out a song in a tone-deaf voice, Apple Bloom tries to dance despite poor coordination and dexterity – it is an entertaining spectacle in its own right, full of energy and personality, and even as the set crashes in at the end, they’re fighting their way through to keep the show going even as they loose their ability to cover. Again, these are not untalented girls. They’re just not being true to their individual abilities because they haven’t learned to recognize those abilities, which is something that can’t really be taught. And I do love how they perk up at being awarded a “Best Comedy Act” prize, which sends them veering down another wrong path, the knowing adults sighing that one day they’ll get it. This is how you write children in a show FOR children. Not as delightful tornadoes who makes adults miserable, but as complex characters just beginning their life journey, and hopefully inspiring a kid who watches to stop and think about what they’re special at, what talent they didn’t even recognize was there could grow and bloom into something they’re passionate about. This episode, more than any of the others this season featuring the trio, serves effectively as a microcosm for who the CMC are and what they’re all about. In a way, because this serves as such a fantastic introduction to the group, I kind of wish it was placed a little bit earlier in the series, although that would likely have made the mediocre CMC half of last week’s episode feel like even more of a decline. As it stands, I prefer to just think of last week as a Fluttershy-centric episode and that this is where the CMC properly get their kick-off. In the course of the first half of the episode, we get to see what will become the typical mix of success and failure for the endeavors of the Crusaders as we watch them do their thing (which we actively get to see on a wider scale this time, as opposed to the barely contained chaos of last episode, but then, their options this time go beyond either being confined to a rather small cottage or in the most dangerous place somepony in their town could go), but as Noel pointed out, it’s not a pure cascade of incompetence. Their clubhouse is a good example of what can go right for them when they aren’t distracted by deciding they need to do EVERYTHING in the name of attempting to get their cutie marks, and it’s notable that the one time they aren’t checking their flanks is when they are genuinely doing the things they are good at, because it doesn’t occur to them that it could even be their talent. And the montage does a great job of showing off what I mentioned last week as being one of their great strengths, their refusal to give up after each task ultimately ends without success. As Noel points out, it’s not always a case of catastrophic failure. They actually give a pretty good shot at just about everything they try considering their relative age. Their attempt at running a hair salon is terrifying (one of the few outright failures), but also feels genuinely like a way kids would mistakenly think to do something like that. They don’t cease to be something of a menace in the course of their crusade (they trash Twilight’s library, much to Spike’s chagrin, and swipe Rarity’s supplies from her shop), but because we’re squarely focused on their journey it’s not dwelt on for very long. They don’t understand the trouble they’re causing and are laser-focused on their own goals, and so move on quickly, and we’re pulled right along with them rather than spending the time with the adults beyond their initial reaction to witnessing the group’s shenanigans. 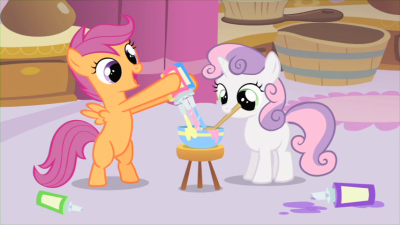 As a side note, “Cutie Mark Crusaders Go Crusading” (the tune playing during the montage) is a particularly fun bit of background music that does a great job of carrying the scenes along with a fitting level of energy and playfulness for the three, dropping down appropriately when the tasks don’t result in a cutie mark for any of them. I love that the tune goes slightly distorted and blobby when they’re underwater. Of course, along with that determination comes a bit of stubbornness, as all three of them shrug off the idea of doing the things that they’d be best suited for in the course of putting together their talent show number, and the responsibilities instead wind up shuffled among themselves, leaving each of them in charge of something they aren’t particularly good at. For Scootaloo and Applebloom it’s just about wanting to do something they think is cool, but Sweetie Belle’s choice comes very much out of her idolization of her older sister (which we saw bits of last episode as well). 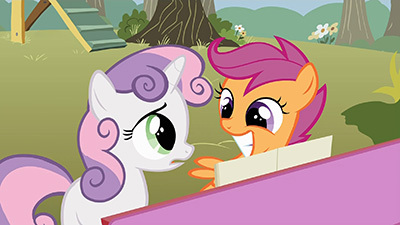 Where arguably Scootaloo and Applebloom have no real idea what they’re hoping their talent will be, Sweetie Belle clearly has a preference, wanting to be just like Rarity. Unfortunately, she doesn’t quite have the skill to back it up (although she does manage to put together costumes for the three of them that actually fit, so she’s not actually that bad at it). I love everything about the talent show song. The tune itself is very much a parody of cheesy 80’s music, and the costumes the three are wearing are vaguely reminiscent of the gaudiest of hair metal band outfits. A nice touch is Applebloom’s bandanna, covered in skulls, the shape of which are elongated just enough that they’re arguably equine (at least, MLP’s tiny headed version of equine). It’s also a lot of fun hearing two genuinely good singers forcing themselves to sing terribly (which took an awful lot of work on the part of the show staff to get Michele Creber and Madeleine Peters to sing badly enough for it, and even afterwards Daniel Ingram had to go back and mess with the pitch of their vocals because their singing was still too good). Okay, let’s just get this out of the way. Unambiguous Matrix reference at the beginning of the episode proper? Awesome. 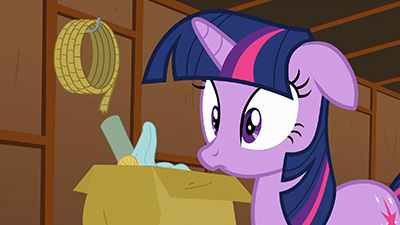 It’s crazy to imagine that it had been roughly a decade since that movie came out when this episode first aired, so many in MLP‘s target audience couldn’t have even lied about their age to see The Matrix in theaters on account of not having yet been born. And since then, “Bullet Time” has worked its way into pretty much everything… including My Little Pony. As far as non-Matrix-y things go, it’s reassuring to learn that the CMCs do in fact have some great talents that they put to good use in the episode, even if they themselves don’t quite put two and two together. What bugged me, unfortunately, was how said talents were so blatantly pushed forward so early on in the episode. Subtle foreshadowing and gradual development aren’t going to be high on most kids’ wish lists when watching Saturday morning cartoons, true, but bazookaing the CMCs’ talents through the television screen straight into kids’ faces seems a bit much. Or, at least, a bit of a missed opportunity: rather than have three conversations of “Wow, you’re great at X! Now let’s never speak of how good you are at X again!” one after the other, the talent revelations at the beginning of the episode could have been treated more like they were in the middle, whereby the girls showed their respective prowesses (can that word be pluralized?) in the ways they helped each other. That would have let the viewers make the “Wow, Y is great at X!” connection themselves, a more engaging and exciting way of drawing viewers in (at least in my books, anyway). But in any case, you gotta hoof it to these gals: despite them being amazingly blind to their own talents, they don’t give up. Their quest around Ponyville is such a fun little segment to watch, and I agree 100% with Tessa that the jingle that plays as they’re crusading is amazingly catchy; it’s probably my favorite “background song” of the entire series. While Daniel Ingram gets all the attention for coming up with the vocal songs (which are wonderful, to be sure), the relatively unnoticed instrumental music that goes on in the background of every episode is done by William Anderson, who deserves some accolades as well. Writing music that is supposed to not steal center stage must become a bit soul-crushing after some time, but this guy keeps at it and does a great job. Also, I can’t help but think the map the CMCs use during their crusade is some oblique reference to the early-80s arcade game “Crossbow” by Exidy. I know I’m probably drawing connections here where there are none, but had one of the CMCs’ activities been crossbow shooting I would have immediately jumped in my car, driven straight to my parents’ house, dug the old Commodore out of the basement, and fired the game up to relive those memories. What a great game. For some reason it seems odd when Twilight addresses the CMCs as “My Little Ponies.” I can see somepony with acknowledged authority such as Celestia or maybe even Cheerilee saying it, but not Twilight. Maybe it’s something adult ponies in Equestrian society say to fillies and colts as a term of endearment? As far as this episode goes, I feel a bit like Twilight above. The CMCs were so close to “getting it,” and that they apparently didn’t is just mind-bogglingly, er, mind-boggling. I suppose had they actually picked up on their innate talents in this episode, the subsequent seasons wouldn’t really have anything for the CMCs to do other than rebuild Ponyville when it’s destroyed every other evening, sing away monsters from the Everfree Forest, and continuously run over Granny Smith with a scooter. So, in a way, keeping the CMCs blind to their own strengths is a clever way of keeping their arc of exploration and self-discovery relevant for as many seasons as desired or needed. It’s not that I don’t enjoy seeing the CMCs get screen time and generally being goofballs (Sweetie Belle is best CMC, btdubs), I’d just prefer to watch the Mane Six grow and mature instead. But that’s just me; the CMCs are ostensibly much closer in age to the target audience of the show, so prominently featuring characters with which kids may more strongly relate is a smart move.